Undersanding the value of Landsat program to the U.S. economy has been the ambitious goal of the Landsat Advisory Group of the National Geospatial Advisory Committee. This team of commercial, state/local government, and NGO geospatial information experts recently updated a critical review of the value of Landsat information that has recently been released to the public. They found that the economic value of just one year of Landsat data far exceeds the multi-year total cost of building, launching, and managing Landsat satellites and sensors. This would be considered a stunning return on investment in any conventional business setting. Full article by Jon Campbell, U.S. Geological Survey found here. From Live Science. Two new maps released Jan. 16 considerably improve estimates of the amount of land farmed in the world — one map reveals the world's agricultural lands to a resolution of 1 kilometer, and the other provides the first look at the sizes of the fields being used for agriculture. The researchers built the cropland database by combining information from several sources, such as satellite images, regional maps, video and geotagged photos, which were shared with them by groups around the world. Combining all that information would be an almost-impossible task for a handful of scientists to take on, so the team turned the project into a crowdsourced, online game. Volunteers logged into "Cropland Capture" on a computer or a phone and determined whether an image contained cropland or not. Participants were entered into weekly prize drawings. Amnesty's before and after satellite images were taken on 2 January and 7 January. Healthy vegetation is shown in red on the graphics.This is related to the paper that Alice and I just published on the use of remote sensing for crime. In that paper, we make it clear that estimates of crime from remote sensing are very difficult to validate; however, these important efforts continue to expand. Case in point from the BBC: Satellite images of Nigerian towns attacked by Boko Haram show widespread destruction and suggest a high death toll, Amnesty International says. The images show some 3,700 structures damaged or destroyed in Baga and Doron Baga this month, Amnesty said. This is in stark contrast with goverment estimates of destruction. The BBC's Will Ross says that while the images show the destructive nature of Boko Haram, they do not help establish just how many people were killed. Last week, Musa Alhaji Bukar, a senior government official in the area, said that fleeing residents told him that Baga, which had a population of about 10,000, was now "virtually non-existent". Congratulations to the NASA NEX Team! They have won the 2014 HPCwire Readers’ & Editors’ Choice Award for the Best Data-Intensive System (End User focused). See the article here: NASA Earth Exchange (NEX) Platform supports dozens of data-intensive projects in Earth sciences. The NASA Earth Exchange (NEX) platform supports dozens of data-intensive projects in Earth sciences, bringing together supercomputers and huge volumes of NASA data, and enabling scientists to test hypotheses and execute modeling/analysis projects at a scale previously out of their reach. NEX-supported applications range from modeling El NiÃ±o, creating neighborhood-scale climate projections, assisting in crop water management, and mapping changes in forest structure across North America, to mapping individual tree crowns at continental scale as a foundation for new global science at unprecedented spatial resolution. NEX’s OpenNEX challenge ties in to White House initiatives, including Open Data, Big Data and Climate Data, which advance national goals to address climate change impacts and include competitions and challenges to foster regional innovation. The GIF has been partnering with NASA NEX, and developing a framework to bring NEX data and analytical capabilities into HOLOS. Worldview-2 has been a very useful sensor; we've used it for some of our wetlands work. On August 13th of this year DigitalGlobe launched WorldView-3 spacecraft. It will provide a 31 cm panchromatic resolution, 1.24 m multispectral resolution, with an average revisit time of <1 day. Introducing WorldView-3, the first multi-payload, super-spectral, high-resolution commercial satellite. Operating at an expected altitude of 617 km, WorldView-3 provides 31 cm panchromatic resolution, 1.24 m multispectral resolution, 3.7 m short-wave infrared resolution, and 30 m CAVIS resolution. WorldView-3 has an average revisit time of <1 day and is capable of collecting up to 680,000 km2 per day, further enhancing the DigitalGlobe collection capacity for more rapid and reliable collection. Launching in 2014, the WorldView-3 system will allow DigitalGlobe to further expand its imagery product offerings. 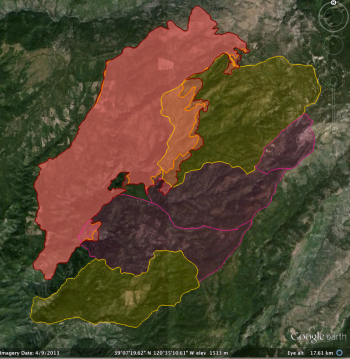 One of our collaborators on the Sonoma Vegetation Mapping Project has sent work on how web mapping and high resolution imagery has helped them do their job well. These are specific comments, but might be more generally applicable to other mapping and conservation arenas. In the past year this included both large wetland restoration projects and the transfer of ownership of several thousands of acres to new stewards. Articulating to potential donors the context and resources of significant properties that became available for purchase. There are properties that have been identified as high priority conservation areas for decades and require quick action or the opportunity to protect would pass. Internal communication to our own staff. We have been involved in the protection of over 75 properties, over 47,000 acres. At this time we own 18 properties (~6500 acres) and 41 conservation easements (~7000 acres). At this scale high quality aerial imagery is essential to the size of land we steward and effective broad understanding. The way it is served as a seamless mosaic means it is available to extremely experienced and intelligent people who find the process of searching and joining orthorectified imagery by the flight path and row cumbersome or inefficient. Besides our own internal prioritization of parcels to protect, I understand that we receive a request a week for our organization’s attention towards some property in Sonoma. Orienting ourselves to the place always includes a map with the property boundary using the most recent and/or high quality imagery for the parcel of interest and its neighbors. 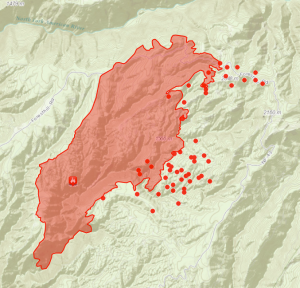 This is such a regular part of our process that we created a ArcGIS Server based toolset that streamlines this research task and cartography. 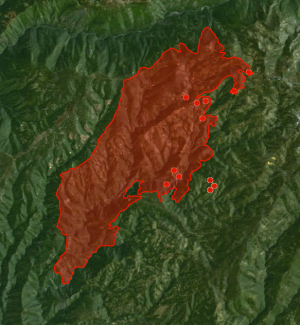 The imagery service we consume as the basemap for all these maps is now the 2011 imagery service. This imagery is of high enough resolution that we can count on it for both regional and parcel scale inspection to support our decisions to apply our resources. Our On the Land Program uses the imagery in their introduction maps to help visitors on guided hikes quickly orient to the place they are visiting and start folding their experience and sense of place into their visit. Grants are an important part of the funding for major projects we undertake. High quality imagery facilitates our ability to orient the grant reviewer and visually support the argument we are making which is that our efforts will be effective and worthy of funds that are in short supply. Knowing what the resources on a property are is an essential part of thoughtfully managing them. In one example we used the aerial imagery (only a year old at the time) as a base map for botanists to classify the vegetation communities. These botanists are not experts in GIS, but by using paper maps with high resolution prints in the field they were easily able to delineate what they were observing on the ground on features interpreted in the photo. We then scanned and confidently registered their hand annotations to the same imagery, allowing staff to digitized the polygons that represent the habitat observed. These vegetation observations are shared with Sonoma County and its efforts to map all the vegetation of Sonoma County. Conservation easement monitoring makes extensive use of aerial imagery. In some cases we catch violations of our easements that are difficult to view on the ground, for example unpermitted buildings by neighbors on the lands we protect, illegal agriculture or other encroachment. It is often used to orient new and old staff to a large property before walking their and planning for work projects that might be part of prescribed management. The imagery helps reinforce our efforts to communicate the challenge to preserve essential connectivity in the developed and undeveloped areas of Sonoma County. In the Sonoma Valley there is a wildlife corridor of great interest to us as conservation priority. Aerial imagery has been an important part of discussing large land holdings such as the Sonoma Developmental Center, existing conserved land by Sonoma Land Trust and others, and the uses of the valley for housing and agriculture. Celebration of the landscape cannot be forgotten. We often pair this high quality aerial imagery with artful nature photography. The message of the parts and their relation to the whole are succinctly and poetically made. This is essential feedback to members and donors who need to see the numbers of acres protected with their support and have the heartfelt sense of success. We look forward to the continued use of this data and the effective way it is shared. We hope that future imagery and other raster or elevation data can be served as well as this, it would benefit many engaged in science and conservation. A series of satellite images from NASA’s Terra satellite, which began capturing the images in 2000, has revealed the shocking decline of water levels in the Aral Sea. For fuller report on this issue, check out the NPR story. Users NASS can download the 2013, 2012, 2011, 2010, 2009, 2008 CDLs; the 2013 confidence layer and the 2013 cultivated layer from National Downloads (file sizes > 2gb). View their latest presentations in .PDF format. The National Land Cover Database (NLCD 2011) is made available to the public by the U.S. Geological Survey and partners. AB1327 is a bill that could potentially impact the work that we do in regards to remote sensing and aerial imagery collection, etc… in the near future. See the link below for more detail. The office of the California CIO, Scott Gregory, is in the process of providing the Legislature a summary analysis of the bill. In our analysis we want to highlight civilian use (non-public safety governmental) cases for UAV technology as a rebuttal to some of the limiting language in the bill. The bill would generally prohibit public agencies from using unmanned aircraft systems, or contracting for the use of unmanned aircraft systems, as defined, with certain exceptions applicable to law enforcement agencies and in certain other cases. The bill would require reasonable public notice to be provided by public agencies intending to deploy unmanned aircraft systems, as specified. The bill would require images, footage, or data obtained through the use of an unmanned aircraft system under these provisions to be permanently destroyed within 6 months, except as specified. If this bill will affect your organization’s future data collection needs, please provide them a brief summary to be incorporated into the analysis. Basically, they are looking for the organization name, use case and description of that use case. Please circulate to the user community within your respective organizations to solicit feedback. Please email or call if you have any questions. He would like to have these complied by 10am Friday (3/14/14). Thanks to Dave Thau, Karin Tuxen-Bettman, John Bailey, and Emily Henderson who came to visit the GIF and give a demo of the GEE toolbox. We went over the guts of GEE, Timelapse (very cool: make your own! Here is mine), the GEE GUI framework, and the GEE API. Very fun afternoon! Happy Valentine's Day Landsat 8! Feb 14, 2014 • Eight months ago, on June 5, 2013, the U.S. Geological Survey decommissioned the venerable Landsat 5 satellite. That day, the USGS Landsat Flight Operations Team transmitted the last command to Landsat 5, effectively terminating the mission and leaving it in a disposal orbit. This week, Landsat 8 overflew the defunct Landsat 5, and thanks to some clever work by Mike Gartley, a Research Scientist with the Digital Imaging and Remote Sensing group at Rochester Institute of Technology (RIT)—a group that has long participated in Landsat calibration and validation—Landsat 5 was seen in an image taken by Landsat 8. In these images, the satellite is seen as a streak of pixels (dark or light depending on the spectral band). There is one image from each of Landsat 8′s OLI bands, except for Band 7, or SWIR-2, where she blended into the clouds and was impossible to distinguish. In these images Landsat 5 is much closer to Landsat 8 than she is to the Earth. More here. I am working on a retrospective of remote sensing of forests in California for the centennial. I am trying to highlight some of the pioneering work done by remote sensors that focused on Californian forests from the 1960s through the use of lidar today. Of course with this topic you must begin with Robert N. Colwell. Dr. Colwell was an internationally renowned remote sensing scientist; he was former associate director of the Space Sciences Laboratory at the UC Berkeley, and he was the instructor of remote sensing in our own Mulford Hall from 1947 until his retirement in 1983. He was NASA co-investigator for Apollo IX, and his research in the 1960s on reflectance and multispectral reconnaissance were the primary basis for selecting the type of sensors and the spectral bands implemented in Landsat. Neat guy, and we all benefit from his intellectual legacy. "Oblique aerial view of Berkeley Campus of University of California taken with Camouflage Detection film." (That is what they used to call color infrared.) "Such photography is superior to any other for certain photo interpretation purposes as indicated by some of the preceding examples. Note in this photo how color values for each species of tree tend to remain uniform from foreground to background because of the superior haze penetration offered by this film. 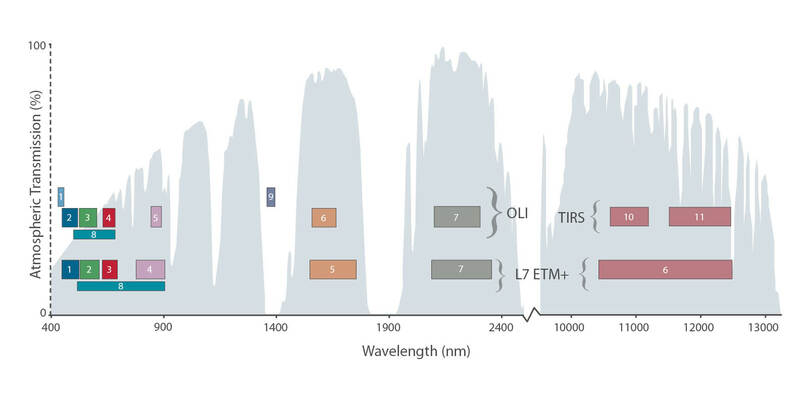 The relatively long wavelengths to which this infrared-sensitive film reacts are scattered but very little by atmospheric haze particles, thus accounting for the uniform color values and for excellent image sharpness." I dig this part: "The original color transparencies have the same color values as seen here and consequently make very attractive panels for lamp shades, although certain of their colors fade upon prolonged exposure to light." The trend for using map products as kitchy home decorations PRE-DATES 1970! Take that hipsters! By 2050 we will need to feed more than 2 billion additional people on the Earth. By playing Cropland Capture, you will help us to improve basic information about where cropland is located on the Earth's surface. Using this information, we will be better equipped at tackling problems of future food security and the effects of climate change on future food supply. Get involved and contribute to a good cause! Help us to identify cropland area! Oh yeah, and there are prizes! Each week (starting Nov. 15th) the top three players with the highest score at the end of each week will be added to our weekly winners list. After 25 weeks, three people will be drawn randomly from this list to become our overall winners. Prizes will include an Amazon Kindle, a brand new smartphone and a tablet. The video describing the partnership and the product is available now. Quantification of global forest change has been lacking despite the recognized importance of forest ecosystem services. In this study, Earth observation satellite data were used to map global forest loss (2.3 million square kilometers) and gain (0.8 million square kilometers) from 2000 to 2012 at a spatial resolution of 30 meters. The tropics were the only climate domain to exhibit a trend, with forest loss increasing by 2101 square kilometers per year. Brazil’s well-documented reduction in deforestation was offset by increasing forest loss in Indonesia, Malaysia, Paraguay, Bolivia, Zambia, Angola, and elsewhere. Intensive forestry practiced within subtropical forests resulted in the highest rates of forest change globally. Boreal forest loss due largely to fire and forestry was second to that in the tropics in absolute and proportional terms. These results depict a globally consistent and locally relevant record of forest change. NASA has announced a partnership with Amazon Web Services that the agency hopes will spark wider collaboration on climate research. In an effort that is in some ways parallel to Google's Earth Engine, NASA has uploaded terabytes of data to Amazon's public cloud and made it available to the anyone. Three data sets are already up at Amazon. The first is climate change forecast data for the continental United States from NASA Earth Exchange (NEX) climate simulations, scaled down to make them usable outside of a supercomputing environment. The other two are satellite data sets—one from from the US Geological Survey's Landsat, and the other a collection of Moderate Resolution Imaging Spectroradiometer (MODIS) data from NASA's Terra and Aqua Earth remote sensing satellites. For three days in late July 2013 Kevin Koy, Executive Director of the GIF and Maggi spent time at Google with 50+ other academics and staff to learn about Google Earth's mapping and outreach tools that leverage cloud computing. The meeting was called Google Earth for Higher Education Summit, and it was jam packed with great information and hands-on workshops. Former Kellylabber Karin Tuxen-Bettman was at the helm, with other very helpful staff (including David Thau - who gave the keynote at last year's ASPRS conference). Google Earth Outreach has been targeting non-profits and K-12 education, and are now increasingly working with higher education, hence the summit. We learned about a number of valuable tools for use in classrooms and workshops, a short summary is here. Google Earth Pro. You all know about this tool, increasing ability to plan, measure and visualize a site, and to make movies and maps and export data. Google Maps Engine Lite. This is a free, lite mapping platform to import, style and embed data. Designed to work with small (100 row) spreadsheets. Google Maps Engine Platform. The scaleable and secure mapping platform for geographic data hosting, data sharing and map making. 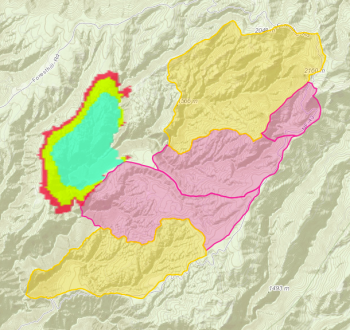 streamlines the import of GIS data: you can import shapefiles and imagery. http://mapsengine.google.com. Field Mobile Data Collection. GME goes mobile, using Open Data Kit (ODK) - a way to capture structured data and locate it and analyze after home. Street View. They have a car in 32 countries, on 7 continents, and are moving into national parks and protected areas. SV is not just for roads anymore. They use trikes, boats, snowmobiles, trolleys; they go underwater and caves, backpacks. An update from Mark about the Proba satellite: http://www.wired.com/wiredscience/2013/07/new-global-vegetation-map/. 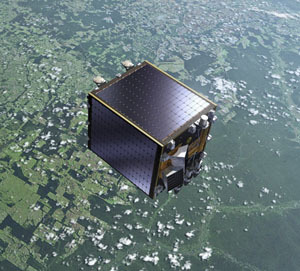 Proba-V is a Belgian-built satellite - the latest in the European Space Agency’s PROBA series of small satellites and will take over vegetation monitoring duties from the Spot-4 and Spot-5 satellites, which are at the end of a 15-year mission. The Proba-V satellite is barely bigger than a washing machine. It was launched just two months ago has already made a wall-to-wall map of the world’s vegetation. It orbits the Earth 14 times a day, covering the entire globe every two days with 100m resolution imager. Every 10 days, a new 200,000 megapixel image of the world’s vegetation is produced. Background: the current Vegetation-1 and Vegetation-2 instruments onboard the SPOT 4 and SPOT 5 satellites will only be available till May 2014. For almost 15 years now, these instruments have daily monitored and mapped the worldwide vegetation, thus providing essential information on crop yields, droughts, desertification, changes in the type of vegetation, deforestation, etc. to an ever extending user community.